Help separate the souls of Gadris and Zur. I met Gadris the Dark Elf and Zur the Khajiit. These two mages share a single body, as their souls were melded at this Vile Laboratory when they arrived in Coldharbour. This soul-meld has weakened them. If they remain combined, they will surely die. Collect Zur's notes and tincture. Squeeze through the rubble and find Gadris' notes. Gather the items and catalyst, and forge the antipodal rods. Meet Gadris at the Overseer's Atelier. Take the Light of Meridia and leave the laboratory. After completing this quest, the Dark Alchemy Lab in The Hollow City will unlock, and Gadris or Zur will be found living there. I gathered Zur's materials. I should look for the entrance to the laboratory, where I hope to find him and Gadris. I should enter the laboratory and give the notes and tincture to Gadris or Zur. I'm not sure which one of the soul-melded mages will be available when I reach them. I need to wait for Zur to craft a potion that will temporarily reduce my size so that I can squeeze through a hole in the rubble and enter the Vile Laboratory. Zur completed the potion that will make me small enough to slip through a gap in the rubble and enter the Vile Laboratory. I should talk to the soul-melded mage and get the potion. The potion turned me into a monkey! Now I can squeeze through the rubble and enter the ancient Dwarven laboratory. I squeezed through the rubble and entered the Vile Laboratory. Now I have to find the Metallurgy Workshop. I made it to the Metallurgy Workshop and reverted back into my normal form. Now I need to find Gadris' notebook. Gadris listed the items necessary to make the antipiodal rods. I need to gather refined void salts, a crystalline essence matrix, and ebony ore from somewhere in this workshop. I have the items from Gadris' notes, but he also mentioned a catalyst for the forging process. I should check to see if he left any notes on what this catalyst might be. According to Gadris' notes, corrupted blood would be the best catalyst for forging the antipodal rods. The experiment chamber should contain corrupted blood created by the Daedra. Some kind of monster guards the chamber, however. Now that I have the components and the catalyst to forge the antipodal rods, I should look for a furnace in the metallurgy workshop. Now I need to forge the melted components into the antipodal rods. There must be a weapon anvil around here that I can use. I forged the antipodal rods for the Dwarven device that the Soul-Meld Mage told me about. I should make my way to the Overseer's workroom and meet up with Gadris or Zur. I found Gadris near the door to the Overseer's workroom. I should talk to him and find out what I need to do next. I need to enter the Overseer's atelier and find the crystal that was used to power the Dwarven device. Now that I have the power crystal, I need to locate the device that melded Gadris and Zur's souls. found a strange-looking Dwarven device. This should be the machine that can reverse the soul-meld and set Gadris and Zur free. I should talk to the mage and get any final instructions. I need to place the crystal into the Dwarven device to provide the power necessary to separate the mages' souls. Two pillars connect to the Dwarven device. I need to insert an antipodal rod into each pillar. That should begin the process of reversing the soul-meld. The soul-meld is unraveling. The souls of the two mages have each been drawn to one of the antipodal rods. Now I need to pull one of the levers to save either Zur or Gadris. I decided to save Zur/Gadris. I should talk to him and see if he's recovered from the soul-meld reversal. 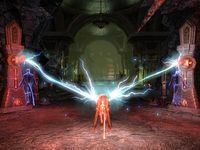 Zur/Gadris thinks that the powerful crystal attached to the device is one of the legendary Lights of Meridia. I should take the crystal. Now that I have the Light of Meridia, I should find the exit door and leave this Vile Laboratory. Finishes quest I should meet Zur/Gadris outside the Vile Laboratory and speak to him.